My great aunt made an incredible sweet potato casserole for our holiday dinners. Iâ€™ve lightened it up a bit, but we love it just the same. Preheat oven to 350Â°. 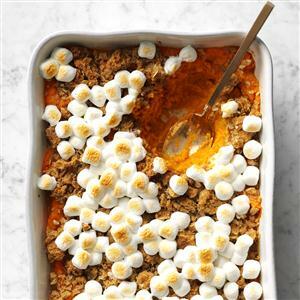 Place sweet potatoes in a 6-qt. stockpot; add water to cover. Bring to a boil. Reduce heat; cook, uncovered, 10-12 minutes or until tender. Meanwhile, make topping by combining flour, brown sugar, oats and salt; cut in butter until crumbly. Drain potatoes; return to pan. Beat until mashed. Add sugar, milk, eggs, butter and vanilla; beat until combined. Transfer to a broiler-safe 13x9-in. baking dish. Sprinkle topping over potato mixture. Bake, uncovered, until topping is golden brown, about 45 minutes; let stand 10 minutes. Sprinkle with marshmallows. If desired, broil 4-5 inches from heat, 30-45 seconds or until marshmallows are puffed and golden. Yield: 12 servings. Test Kitchen tip If you add the marshmallows right out of the oven, they'll start to melt together and form a silky marshmallow layer.